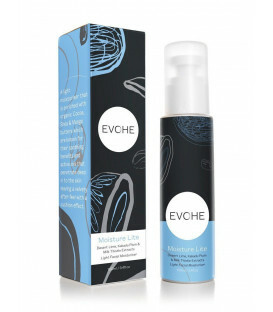 Evohe Refining Face & Eye Serum is specifically designed to improve the look and feel of the skin area around your neck, cheek and eye area. These facial area's, having little supportive muscle density underneath are particularly prone to the effects of dehydration and aging! 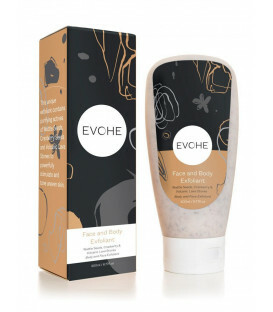 Evohe Refining Face & Eye Serum helps balance your skins pH levels bringing vitality and depth back to your skin. 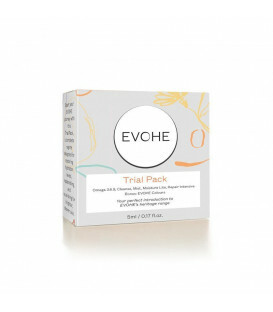 Evohe Face & Eye Serum's unique formulation is specifically designed to hydrate and smooth fine lines around the eye, cheek and neck area's. 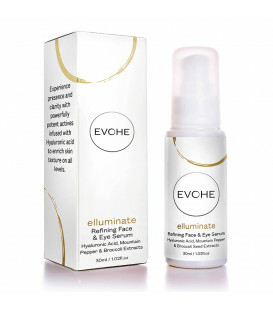 Due to the extra hydrating properties of this unique blend of vitalising properties, dark circles around the eyes are quickly addressed while improving the overall health & vitality of your skin. Feel protected against free radicals with this concentrated serum packed full of nature’s gifts. 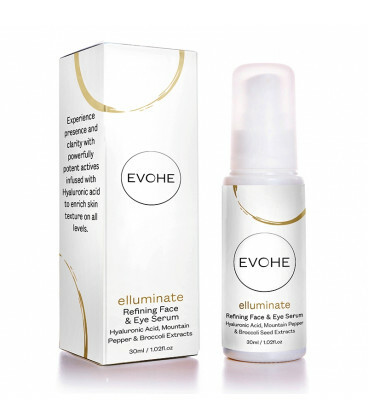 Included in the Evohe Face & Eye Serum formulation is a world breakthrough natural, stable and active bioavailable Vitamin C that offers something exciting for hydration, depigmentation, collagen synthesis, brightening, wrinkle reduction and anti-ageing. 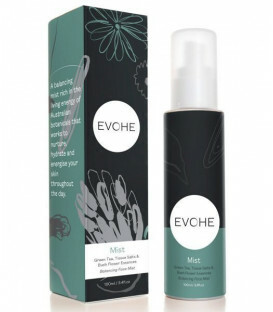 It is by working with some of nature’s most potent ingredients using Biomimicry Cellular Extraction that Desert Lime, Kakadu Plum, Finger Lime & Milk Thistle Extracts (which are known for their potent antioxidant, anti-inflammatory & skin cell repair properties) are included in this nutrient rich formulation.providing you with luxury that your skin will adore. Hyaluronic acid is a glycosaminoglycan that is found in ready supply in youthful skin. In our early years our skin has a plump and full appearance that holds moisture and radiates vitality. 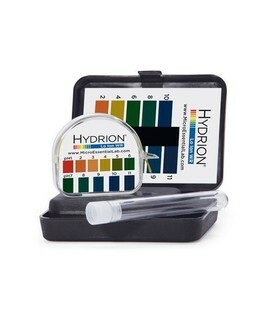 This is due to the high hyaluronic acid concentrations that are produced and distributed by the body to your skin. As we age, due to many reasons including dehydration, toxins and stress etc., the production of glycosaminoglycan slows down leaving the skin without the necessary ingredients to retain moisture. It is believed that one gram (0.03 ounce) of hyaluronic acid can hold up to 1000ml (1 litre) of water which can well explain the visible plumpness of youthful skin. Due to hyaluronic acid's unique properties it is able to penetrate the skin’s upper layers to improve and benefit the skin even when applied topically. Apply to clean skin nightly, using the tips of your fingers. Gently smooth a pearl-sized amount onto the eye area, nose, face and neck until thoroughly absorbed. 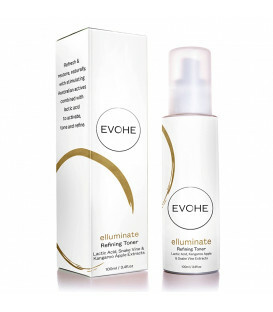 Use nightly after Evohe Refining Toner. 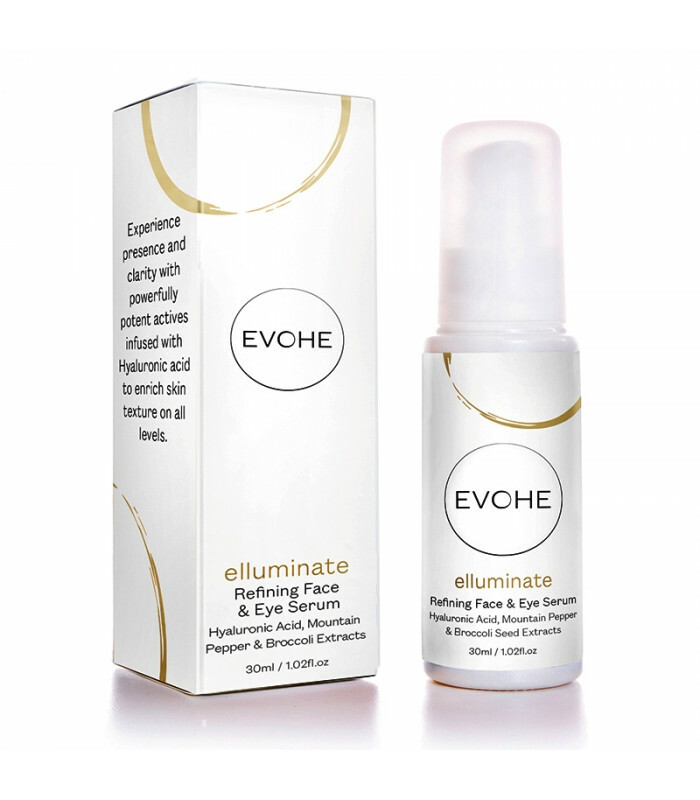 Can be used in conjunction with Evohe Moisture Lite or Omega 3.6.9 to assist with moistening & nourishing the skin and enhance coverage & hydration.